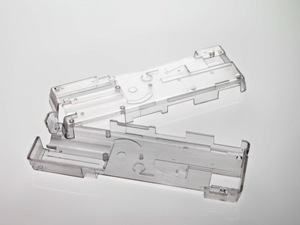 The new materials will be marketed by Altuglas International as Plexiglas®/Altuglas® Rnew biopolymer alloys. Primary co-marketing efforts for these materials will be for durable goods applications, where the Plexiglas®/Altuglas® brand is synonymous with high performance, durability and clarity. The agreement grew out of the overwhelming response the two companies experienced during the National Plastics Exposition (NPE) last April, during which they jointly displayed examples of molded and thermoformed products made with their collaborative technologies for the durable goods market. Marc Verbruggen, NatureWorks president and chief executive officer said, “By combining our respective reputations and strengths in biopolymers and acrylics, NatureWorks and Altuglas International will co-market clear materials that offer a complete package of innovative product performance. This is exactly what Ingeo™ was designed to offer.” Through the collaboration, Altuglas International and NatureWorks will pool resources to accelerate the introduction of these new high performance biopolymer alloys into the market.